Hundreds of thousands of bridges across the country are in bad shape, and the result can be tragic. Artist and researcher Nickolay Lamm took photos of structurally deficient bridges in his hometown of Pittburgh to show what the problem really looks like. 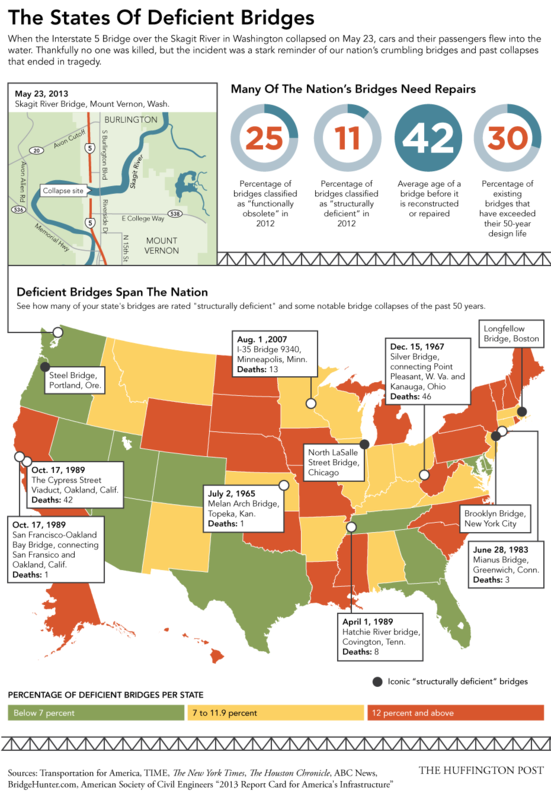 Severe rust, corrosion and structural defects may make you think twice about driving over structurally deficient bridges in your area (scroll down for a state-by-state map). Images courtesy of Nickolay Lamm/The Sad State of Our Nation's Bridges Captions provided by Raymond A. Hartle, P.E., Department Manager - Bridge Management Services, GAI Consultants, Inc., Pittsburgh, PA.
Liberty Bridge (23.5 sufficiency rating) This bridge is a multi-span continuous Riveted Steel Deck Truss Fracture Critical bridge type. Second Ave Nine Mile Run (12.9 sufficiency rating) This is another old steel truss bridge with deterioration throughout. The very severe steel corrosion photos are of secondary bracing members. Thompson Run Rd over Thompson Run (62.5 sufficiency rating) This is a steel multi-beam bridge with advanced section loss due to corrosion.